Boston Terrier Training & Aggression | Need A Chicago Dog Trainer? These dogs look like the American cousins of the French Bulldog. Their small size makes them great for apartments and homes of all sizes. 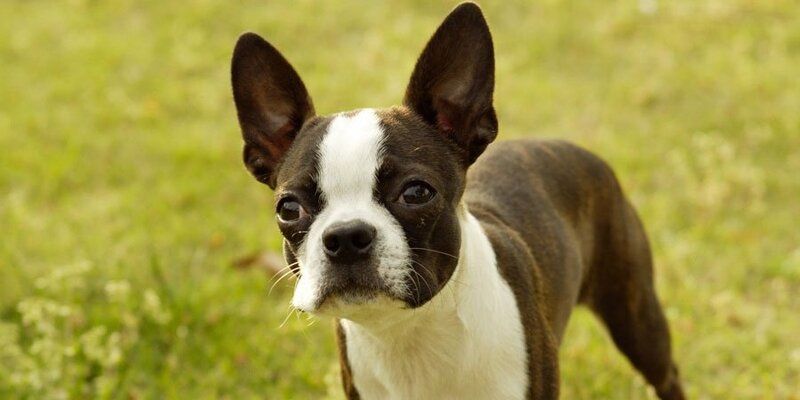 In sharp contrast to the breed’s current standing as “The American Gentleman,” Boston Terriers were originally bred in the era of blood sports. The Boston Terrier’s ancestors were a result of 19th-century Englishman experimenting with different breeds that were good at pit fighting. One of those experiments was a Bulldog and an English Terrier. That little dog was sold to an American and taken to Boston. Over time, through selective breeding, the large and stocky Bulldog and English Terrier mix became the modern Boston Terrier. Since then, the breed has become both the mascot of Boston University and the official dog of Massachusetts. In general, these are cheery and friendly dogs who love people of all ages, but they should be supervised when they’re playing with children. They are normally calm dogs but can be very protective of their loved ones. Every Boston Terrier has different exercise needs, but their owners should participate or at least supervise their exercise, or else they may just want to go back inside. They also don’t do well in extreme weather, so there are some protocols owners may need to follow to make sure they’re OK when it’s very hot or cold outside. But, when they’re playing, you shouldn’t let them participate in rough games, such as tug-of-war or chase, for exercise, as it may result in the development of bad behaviors. Instead, let your Boston Terrier play fetch with balls or other toys, or even canine sports like rally and agility. Bostons’ protective natures can result in aggressive behaviors toward strangers and other animals. Despite their small stature, Bostons are very strong dogs, and they should never be allowed to jump on or growl at other people or animals. Puppy training courses and early socialization are highly recommended for this breed. You may also want to consider potty training sessions, as they can be tough to housebreak. During training sessions, these dogs do best if they’re rewarded as opposed to being scolded. But they are intelligent dogs who learn quickly, and they enjoy pleasing their owners.